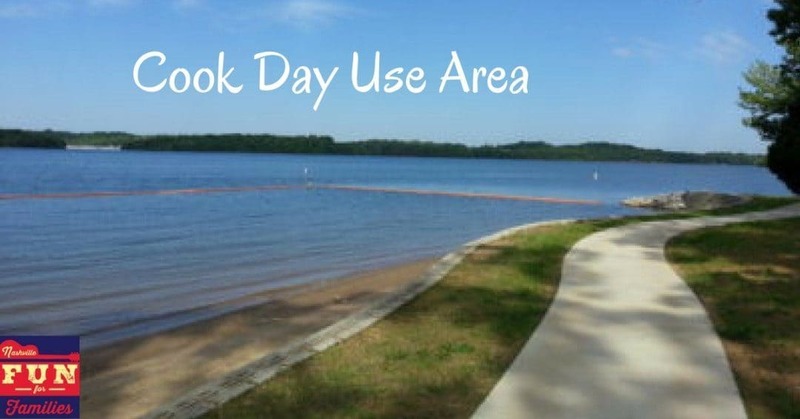 Located on Percy Priest Lake, Cook Day Use Area is a great place for swimming, picnics, and more. When you enter the area you will first have to stop and pay an entrance fee. It is 5 dollars per day for a car load. If you walk or bike in the fee is 2 dollars. If you drive straight after entering you will enter the picnic and Beach area. A small play scape is located here. It’s fairly new and in great condition. There are benches throughout this area for resting, watching, or duck feeding. There is a bathroom facility between the two picnic areas. It is surprisingly clean and well maintained. ( I don’t expect much from park bathrooms. Years of bad experiences.) There is also a water fountain. If you turn left after entering the day use area , you will head toward the pavilion areas. There are two picnic shelters. The first is directly across from the beach. There is a walking trail to access the beach without driving to it. You’ll find lots of parking in this area, gorgeous views of the lake and a boat launch. There is a paved trail from this parking area to shelter #1.This shelter is huge. It has at least 8 picnic tables and two large grills. It is also equipped with lighting for night use. There is a large green space next to it with a big play scape. Shelter #1 is not directly on the lake. If you continue past the entrance for shelter #1, you will enter the parking area for shelter #2. If I was having a big event I would probably park here for either shelter. It would be much less walking. Shelter #2 is right on the lake. It is smaller than shelter #1. It holds 4 tables. There are at least 10 additional separate picnic areas near this shelter. Each has a table and grill. You can also find a walking trail between these two shelter areas. The Three Hickories Nature Trail is 1.6 miles long.